Premium Block Blob Storage, which is currently in limited public preview, unlocks a new level of performance in public cloud object storage. It uses a combination of solid-state drives in our storage clusters and enhancements to our blob storage software to provide high throughput and very fast response times. In this blog post we will take a closer look at some of these performance enhancements. Many enterprise applications and the users that use them require very fast response times. Storage response time, also known as latency, is often a significant portion of the overall time users must wait for a response. At Microsoft Ignite 2018, I did a storage latency demonstration, comparing Premium Blob Storage to our Standard Blob Storage. The demo reads a random selection of 10,000 objects from a population of 1,000,000 64KB objects measuring time to last byte. Each object is a binary random byte array. In the demo, the average latency for Standard is 61.4ms compared to Premium at 5.3ms, which is more than an order of magnitude better. 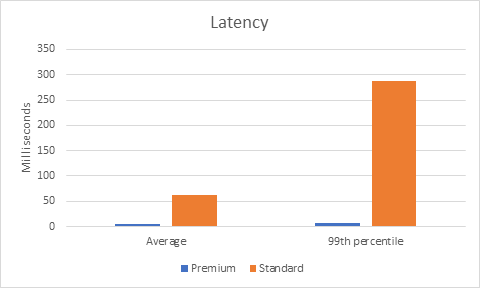 It is equally important to consistently provide low latency, which we measure by looking at the 99th percentile. In the demo, the 99th percentile for the standard is 287.3ms compared to 6.9ms for Premium, which is a whopping 40 times better. Premium Blob Storage also provides better throughput, especially for smaller object sizes. I used AzCopy v10 to measure upload and download of 100,000 64KB objects. I used a Standard D32v3 VM with a 100GB RAM disk to minimize the impact of local VM storage performance. In this measurement both upload and download of 100,000 64KB objects completed ~5x faster on Premium Blob Storage. Finally, I compared List Object performance using the same 100,000 64KB objects, completing ~2.5x faster on Premium Blob Storage. List Object completed ~2.5x faster on Premium Blob Storage. We are very excited about the performance capabilities of Premium Blob Storage and we hope you are, too. The limited public preview is currently available in North Europe, US East, US East 2, US Central, and US West. You can find out more details on how to sign up. We look forward to hearing your feedback, which you can send to premiumblobfeedback@microsoft.com.